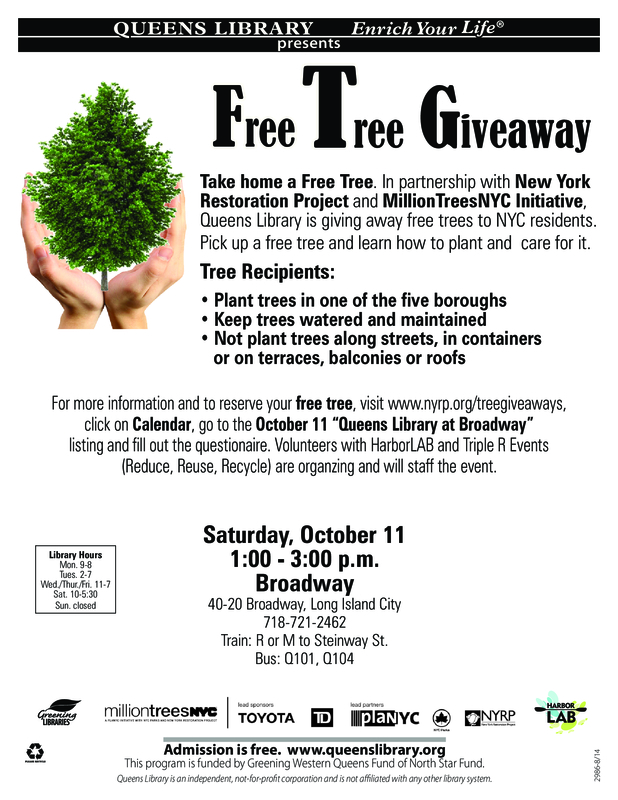 HarborLAB and Queens Library Tree Giveaway! Come get your pear, apricot, and fig trees at the Broadway Library in long Island City on October 11! Better yet, come help HarborLAB to distribute the trees to city residents as a friendly and informative volunteer! HarborLAB and Triple R Events are coordinating and staffing a MillionTreesNYC and New York Restoration Project fruit tree giveaway from 1PM-3PM on Saturday, October 11. HarborLAB coordinates tree giveaways each spring and fall. To help, email volunteer@harborlab.org with the subject line “Tree Giveaway.” Lynne Serpe and Erik Baard are managing outreach and volunteer coordination. Why is an estuary group distributing trees? Plants and the soft earth surrounding them absorb rainwater that would otherwise overwhelm our sewer system. When our sewer system reaches maximum capacity, engineers must release untreated sewage into our waterways or back up into our neighborhoods and homes. Trees do a wonderful job of soaking up that excess water and using it to grow, or shedding it into air through leaves. Locally grown fruit also reduces our city’s carbon footprint, slowing sea level rise, ocean acidification and warming, and climate chaos.